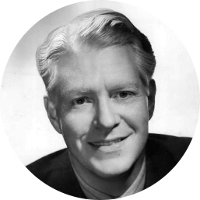 Nelson Eddy was a singer and movie actor who starred in over a dozen musicals. He has three separate stars on the Hollywood Walk of Fame, one each for film, radio, and music. At one point, he was said to be the highest paid singer in the world. In January 1941, Nelson Eddy was one of the stars to perform at President Franklin D. Roosevelt's third inauguration. Performing among stars like Irving Berlin, Mickey Rooney, Raymond Massey, Ethel Barrymore, and Charlie Chaplin, he was the only star to appear in both halves of that night's performance. Born in Providence, Rhode Island, Nelson Eddy did not begin his adult life in the spotlight. His younger days found him working in the shipping department of an iron works followed by several stints as a reporter and copy reader for Philadelphia newspapers. His musical training eventually led him to leading roles for the Savoy Opera Company. It was an opera performance in Los Angeles that led to his signing with MGM studios and a successful film career. Nelson Eddy has a few presidential connections that include Franklin Pierce, James Garfield, William Howard Taft, and both Presidents Bush. First Ladies also appear with kinship to Grace Coolidge and Barbara Bush. Nelson Eddy is not to be left without his share of celebrity kin including Bing Crosby, Lucille Ball, Henry Fonda, and Rock & Roll Hall of Fame guitarist Duane Eddy. In 1676, New England colonists were engaged in an armed conflict with Native Americans led by a chief who had adopted the English name of King Philip. The conflict became known as King Philip's War. On March 26 of that year, Captain Michael Pierce led approximately sixty colonial militia and twenty Native American allies in pursuit of an enemy party reported along the Blackstone River near present day Central Falls, Rhode Island. As Captain Pierce and his men approached a ford in the river, they spotted a group of braves fleeing into the woods. They immediately gave pursuit and were led into an ambush. Captain Pierce and most of his men were killed in the ensuing battle which became known as Pierce's Fight. Nine of Captain Pierce's men would escape the initial battle only to be captured later and tortured to death. The remains of these nine men were discovered by the colonists and buried on the spot where they died. A monument known as Nine Men's Misery is currently erected at this spot. Captain Michael Pierce is the 7th great grandfather of Nelson Eddy. Another colonist who died that day was John Low. John Low was the 6th great grandfather of Nelson Eddy. Hannah Griswold is the 4th great grandmother of Nelson Eddy. She was married to Nathaniel Kendrick who died about 1771 in Hanover, New Hampshire. Evidence is needed to shed light on the identities of Hannah's parents. I would like to know if she is connected to the Griswold family that is found in 17th century Connecticut. A connection to that family would give Nelson Eddy a number of additional famous kin.